In celebration of Ramadhan, shop while you increase your charitable activities at our exhbition. This exhibition features exciting products and promotions for Hari Raya preparations with great deals from fashion clothings, fabrics, accessories, beauty products, home decorations, curtains, rugs to Indonesian furniture.Shop for your Raya essentials and enjoy exclusive promotions at our Singapore, Malaysia and Indonesia pavillions. Don't forget to check out our very own "Food Truck" street specially brought to you from Malaysia! Tuck into your favourite local and traditional dishes including satay, dendeng, ayam perchik, lemang, rendang and many more! Visitors will also get to enjoy delicious bubur lambuk which will be given out free for iftar every single day! So do come early to avoid disappointment. Meet your favourite celebritties selling and promoting their own brand of products. Mingle with them and catch them live at their very own Celebrand booths. Celebrities to look out for includes the likes: Amy Search, Yana Samsudin, Siti Elizad, Datin Alyah, Raja Ema, Fahrin Ahmad, Atul Mok Cun, Ramlah Ram, Mia Ahmad, and many more! 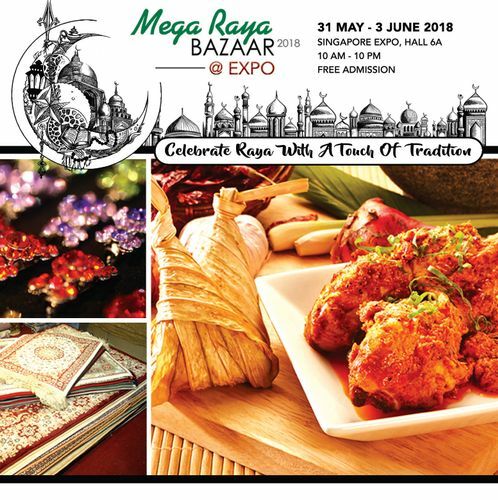 Grab your family and friends and head down to our Mega Raya Bazaar.